Are you wondering “what can the Google Home Mini do?”. 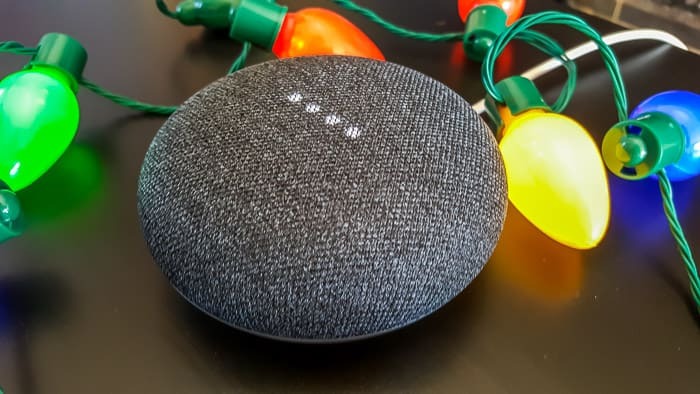 If you’ve been paying any sort of attention in the past year, you’ve probably heard a lot of buzz about the new Google Home and Google Home Mini. 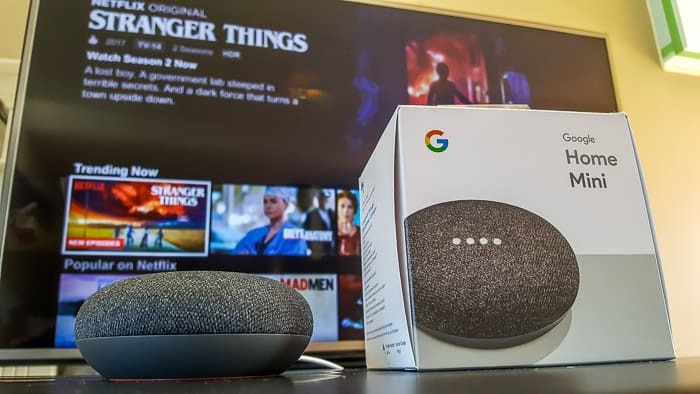 All that buzz is well deserved: the Google Mini is a slick, futuristic voice-controlled speaker that you can use to to play music, control smart home gadgets, answer fun trivia questions, add to a shopping list, create appointments or timers, or even play video! The Google Mini is about the size of a donut, and it has all the brains of the Google Assistant behind it. Our family of four has had our Mini for a couple of months now, and we’re loving it, and using it every day. I love that it can give hands-free help whenever I need it! The Google Home Mini (and the larger Google Home device) are powered by Google Assistant, and they can help you with all sorts of things. 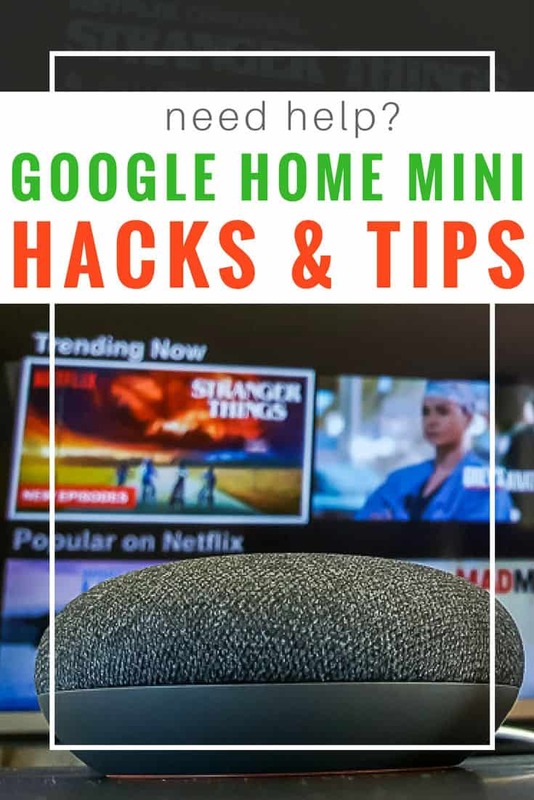 We’ve chosen our top 10 fun things that the Mini helps us with on the regular, but if you’re looking for an exhaustive list of Google Mini tips and tricks, check out what it can do on Google here. You can use the Google Assistant on the Mini to make hands free phone calls. Just say, “Hey Google, call Mom”, and bam – you’re no longer in Mom’s doghouse for not calling! Talk to Dustin from Stranger Things! Want to see what the Google Mini can do? 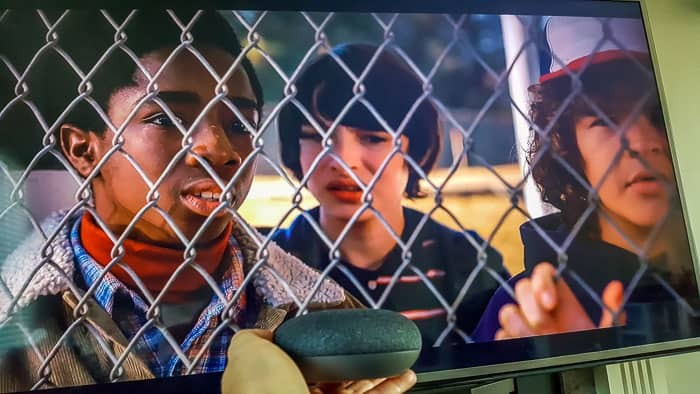 Let’s have a little fun, where we use our Google Home Mini to chat with Dustin from Stranger Things 2. Because who doesn’t love that combo! Seems like a lot of people love Google Mini and Stranger Things, with our video racking up over 17,000 views. This is huge for us! It’s a lot of fun to see the kiddos using the Mini to play games like Akinator, which is a pretty amazing game that (I swear!) can read your mind and tell you what character you are thinking about, just by asking a few questions. To try it, just think of a real or fictional character, say “OK Google, Play Akinator” and Akinator will ask you questions and try to guess who it is. It’s downright amazing how accurate Akinator is! Still wondering “What can Google Home do?” Next up – one of my favorite features of Google Assistant on our Mini. Because we could, we ran out to buy a couple of smart plugs that connect with the Google Home and Mini as soon as possible. We then plugged in a floor lamp to one smart plug, and our lava lamp to another plug across the room. From there, we connected the plugs in Google Assistant (which took all of five minutes – so easy!). Same goes for the lava lamp, we say “OK Google, turn on the lava lamp” for it’s own brand of extra groovy fun! You can see the long list of supported devices here. Because we live in Canada, and the weather ranges from two feet of snowfall to 100 degrees Fahrenheit, checking the weather is pretty important to us. Just ask the Assistant “Hey Google, what’s the weather”. If you have a TV that has Chromecast plugged in or built-in, you can just ask the Mini to play a show. It’s pretty easy, we just ask Google Assistant to play Stranger Things on Netflix, and voila, we’re in the Upside Down! Our kids have a blast pranking us with this. They tell the Mini in our living room “Hey Google, Play My Little Pony on Netflix” upstairs on our TV, and suddenly our bedroom TV is playing the show! I love this feature, because so many of my days are jam packed. With one quick little “Hey Google, what’s my schedule?”, I can hear what’s on my Google Calendar for the day. We have a Google Play subscription, which we use and love, and which lets us play almost anything we want through our Google Mini. Just say “Hey Google, play some music” or “Hey Google, play some Ed Sheeran”. Tip: Google home also works with Spotify! So, getting somewhere on time with a family of four isn’t always the easiest thing in the world. We’ve found it’s a heck of a lot easier these days with the help of a few timers. Here’s how to do it – just say “Hey Google, set a timer for 10 minutes”. I always seem to think of something to add to my shopping list when my hands are full, or when I’m in the middle of chopping veggies. Now, all I do is say “Hey Google, add carrots to my shopping list”. So much easier than finding a pen and paper and adding to a list on the fridge. Plus, I can access my Google Shopping List through the Google Home app on my phone anywhere I go! There’s a pretty exhaustive list of what the Google Home Mini can do on Google here. Where can you buy a Google Mini? You can pick up a Google Home Mini on the Google Store, or at almost any retailer like Walmart or Best Buy. We received a Google Home Mini for review, but all opinions are our own. Thanks for sharing! Innovative products like these are bringing about a revolution I think! Looking forward to using them real soon!